There’s nothing like a filling and satisfying smoothie after a good workout to provide your body with the fuel it needs to recovery and rebuild. 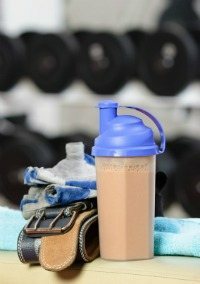 I recommend that you use your favorite protein powder in many recipes and can’t emphasize enough the importance of using a high quality protein powder. Last year a Consumer Reports test revealed contaminants such as cadmium, arsenic, lead and mercury present in some protein powders. You sure don’t want any of those heavy metals in your smoothies. I personally use and recommend Sun Warrior and Dr. Mercola’s Miracle Whey protein powders. I’ve done my research on both and found them to be top of the line. Sun Warrior is raw vegan for people that don’t do animal products. Both come in a chocolate flavor that I love and provide enough tastiness that I don’t need to add an additional sweetener. Here’s my favorite post workout smoothie recipe that’s high in protein and tastes great. Enjoy! Place all the ingredients into your blender and blend on high for 30-45 seconds or until desired consistency is reached. Feel free to post a comment about post workout protein smoothie. If you tried it, I’d love to hear how you liked it. Happy Blending! I enjoyed your smoothie a lot. I followed your ingredients except I added a bit of peanut butter, delicious! Thanks for sharing. Adding a little peanut butter was a good call. Cheers!